Starring: Steve Wiebe, Billy Mitchell, Walter Day. In the same vein as WORDPLAY and SPELLBOUND, this is a hilarious documentary that enlightens as it entertains. Billy Mitchell is a towering figure in the world of classic video games such as DONKEY KONG and PAC-MAN. He has held records in several games, and his high score in DONKEY KONG (considered the toughest of the old titans) has been unbeaten for decades. But newcomer Steve Wiebe finds purpose in the game after losing his job, and discovers his natural aptitude at the game. The amiable Steve is just as likely to win the "nice guy of the year" award as he is to best Billy's record, and this film casts him as a classic hero that viewers love to root for. While Steve is an audience favorite, Billy is a Machiavellian mastermind that rivals any villain from a narrative film. 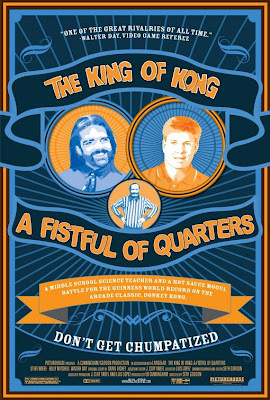 Even though some might argue that the Super Bowl or NCAA tournament is more important, the competition in THE KING OF KONG rivals the most exciting in sports. Thanks to the film's wonderful characters, it's easy to get involved in the drama. Sometimes truth is stranger than fiction, and the people who populate THE KING OF KONG are as fascinating as any screenwriter's creation.